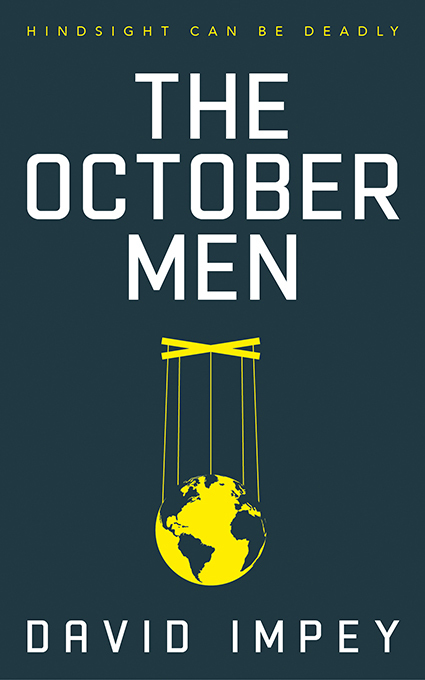 David Impey is launching his first published novel ‘The October Men’ on March 20th. The book, which is a conspiracy thriller based on the evidence of time travel, shies away from the normal, linear story arc and, instead, goes for something much more fragmented. Here David tells us why he opted for this approach to plotting. How many times have you been sitting on a bus or in a waiting room trying to kill time idly thinking about something or nothing in particular? Only to find that your thoughts have taken you somewhere completely different? You then have to think hard to trace your path from the first subject to the final one. This is because, very often, one event or action will create ripples that fan out and encompass new and evermore complex situations. And you are at the centre of it all - bewildered by how so many different strands of your life seem to impinge on each other. That’s what I tried to do with ‘The October Men’. It’s a story which tries to put the reader at the centre of the plot twists and turns, rather than some protagonist to which you are supposed to ‘relate’. I therefore tried experimenting with the concept of the book as an in-tray: you are confronted with a pile of paper of which you are expected to make sense. At first, all the bits of information don’t seem to form any cohesive narrative but, then, gradually as you immerse yourself in the soup of data, the patterns emerge and the plot forms before you. Humans are innate at detecting and deciphering patterns, so why not exploit that in novel form? The next thing the book does is to take the plot as revealed and then extrapolate it forward in directions that will be unpredictable. The book’s denouement (for want of a better term) happens about three-quarters of the way through. The remaining quarter examines the repercussions of what comes out. It’s a bit like following the story of two lovers in a romance after they’ve walked off into the sunset. Do they remain in a state of enraptured bliss (of course not!)? Do they stay together? Do they have money troubles? Does one lose their job/ health / mind / etc? Which brings us back to that idle daydreaming I mentioned at the start of all this. A lot of the plot twists were literally dreamed up during moments of enforced idleness where I would consider one of the situations some of the characters found themselves and then asked: “What if such-and-such were to happen? What then?” In most cases, the answer presented itself without having to delve too deep and, in that, case, I knew it was going to be rational and unforeseen. So, was I trying to be deliberately ornery by subverting or disrupting the norms of novel-writing? Was I being somewhat uppity given that this is my first novel? An extract from 'The Day of the Orphan' by Dr Nat Tanoh - released TODAY!